The history of wildfire in Yellowstone is long and varied. Even before written records of fire with the advent of Yellowstone National Park in 1872 we see evidence of fire in soil profiles, lake sediments, land slides, and in old-growth trees that have been scarred by fire. It is clear that wildfire has had a role in the dynamics of Yellowstone’s ecosystems for thousands of years. 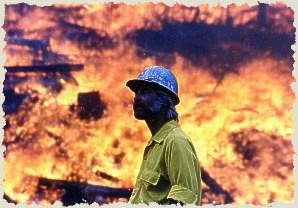 Although many fires were caused by human activities, most ignitions were undoubtedly natural. The term “natural ignition” is nearly synonymous with a lightning strike. Afternoon thunderstorms occur frequently in the Northern Rockies but release little precipitation, a condition known as dry lightning. In a typical season there are thousands of lightning strikes in Yellowstone. Lightning strikes are powerful enough to rip strips of bark off of a tree in a shower of sparks, and blow the pieces up to 30 meters (100′) away. However most lightning strikes never result in a wildfire because fuels are not in a combustible state. Fuels are typically wood, foliage or grass. Fuels may be fine, such as twigs and needles, or heavy, such as logs, branches and whole trees that have blown down in a storm. Fuels may also be living such as an understory layer of tree regeneration or a layer of shrubs. In order for an ignition to take place, the fuels must be dry. As spring advances into summer, temperatures increase and the relative humidity decreases– factors which dry fuels. On average in Yellowstone, fuels dry out enough to ignite the first wildland fire of the year about the middle of June. Young forests generally do not have the fuel load that mature and old-growth forests do. Many young stands of trees are regenerating old burns and consequently haven’t had time to accumulate fuel. However, as a stand develops it accumulates fuel: needle-cast, fallen branches, lichens, and logs. As the young trees grow they compete for light and other resources. Many don’t survive the competition, and remain in the stand as standing dead snags which fall over and further contribute to the fuels on the forest floor. As trees grow they also “self-prune” old branches that become shaded by new foliage at the top of the canopy. These pruned branches eventually fall off the tree and accumulate as litter on the ground. As the stand grows older and taller the canopy begins to break up, letting light reach the forest floor and allowing the establishment of an understory layer of shrubs and regenerating trees. This understory layer forms a “ladder” of fuel that may allow a ground fire to ascend into the forest canopy. This accumulation of fuel on the forest floor and the continuity of fuels between the ground, understory and overstory are factors that predispose older stands to ignition by a lightning strike. Nearly all of Yellowstone’s plant communities have burned at one time or another. Some plant communities ignite and carry fire more readily than others. Therefore the “fire regime” of Yellowstone is as varied and complicated as the environments within the park. It must be remembered that any forest will burn provided an ignition during periods of prolonged drought, high temperatures, low relativity humidity or high winds. However each type of forest has certain characteristics that cause wildfires to behave differently. Some trees such as Douglas-fir have very thick bark that insulates the tree against heat. The bark protects the cambium (the water and nutrient conducting system between the bark and the wood) which will die if it is exposed to temperatures greater than 60°C (140°F) for longer than 1 minute (Agee 1993). Thick bark ensures that wildfires seldom to kill mature Douglas-fir trees. Other species such as lodgepole pine, whitebark pine, Engelmann spruce and subalpine fir have thin bark but these species have other adaptations to fire. Lodgepole pines have cones that are serotinous; that is, they are glued shut by resin. The heat of a wildfire is needed to melt the resin and allow the cone to open and disperse the seeds within. This adaptation ensures that the seeds of lodgepole pine will not disperse until wildfire creates conditions that favor the establishment of seedlings– diminished litter on the forest floor and plenty of sunlight. Although whitebark pine, Engelmann spruce and subalpine fir are also thin-barked, they are adapted to fire by escaping. That is, they grow in habitats that are less susceptible to wildfire. Whitebark pines grow in open, cold, high altitude habitats that accumulate fuel very slowly. The length of the growing season between snowmelt and snowfall, and the cooler temperatures leave a short seasonal window in which wildfires can ignite and carry. 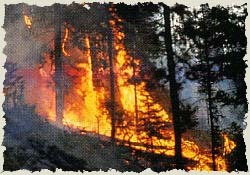 Engelmann spruce and subalpine fir grow in cool, moist habitats where conditions that enable wildfires to burn are infrequent. Aspen also has thin bark and low tolerance to fire but it readily regenerates by sprouting. Aspen clones are connected by a network of roots which survive even very hot fires because they are insulated underground. Although the above-ground stems may be killed by fire the roots send up a profusion of sprouts in the following years. Fire ecologists use estimates of fire return intervals to better understand the role of fire in different forest types. Fire return intervals represent the average frequency of fire for an area or plant community type on the landscape. Natural, historical fire return intervals in Yellowstone range from 20-25 years for shrub and grasslands in the Northern Range (Houston 1973) to 300 years or more for lodgepole pine forests on the central plateau (Romme 1982, Romme and Despain 1989) and subalpine whitebark pine stands. National Park. Ecological Monographs 52(2): 199-221.